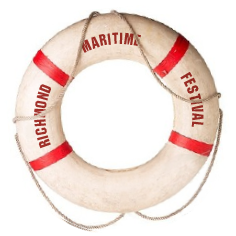 The Richmond Maritime Festival is delighted to announce that Steveston resident, Hazel Cheng, has been selected to create the poster image for the 11th annual festival happening at Britannia Shipyards National Historic Site on August 8 to 10, 2014. Hazel (20) is a third-year student in the Illustration program at Emily Carr University of Art+Design. As an emerging talent, she has exhibited in several group shows and last year, won third place in the 2nd World Cup Live Painting Competition at the Richmond Olympic Oval. As an illustrator, she describes herself as a narrative storyteller with a passion for nature and animal subjects. Hazel began making art at a young age, and is continuing in her studies to develop her communication skills through pictorial means, working in pen and ink, watercolour and Photoshop. She is also very familiar with the Richmond Maritime Festival and the Britannia Shipyards site, having attended the festival over the years and even volunteered as a face painter. From an artistic perspective, she is especially inspired by the boardwalk and marine wildlife of Steveston. Cheng was one of 18 artists who responded to the call to submit samples of their work for consideration. The final poster illustration will be published in June.